I was fortunate to attend one day of the International Builders’ Show last week in Orlando. The Show itself offered acres of elaborate vendor exhibits with the newest gadgets and innovations not to mention the celebrities, chocolates and giveaways to attract builders and consumers to the booth. The central theme of the products was definitely sustainable. From dual-flush fancy commodes to radiant floor heating, every imaginable system was represented. Next year the show moves to Las Vegas for 3 years. I also had the opportunity to meet one of the EVHA reward recipients, Michael Ginsburg, who won the award for his S.E.E.D. (Super Energy-Efficient Design) home in Arizona. I walked around the show with him for a while learning how the idea to use the radiant floor heating for cooling as well. Michael explained he is living in the S.E.E.D. house and has been able to verify a net zero status after the HERS rating was higher due to the unknown component of radiant cooling. A rep from Uponor, the manufacturers of the radiant floor heating system that was used in the S.E.E.D. House, spoke with Michael and me at great length about different projects around the country where cooling is also being tried. This type of system can apparently be used in dry or humid climates depending on other supporting equipment such as the fresh air exchange. 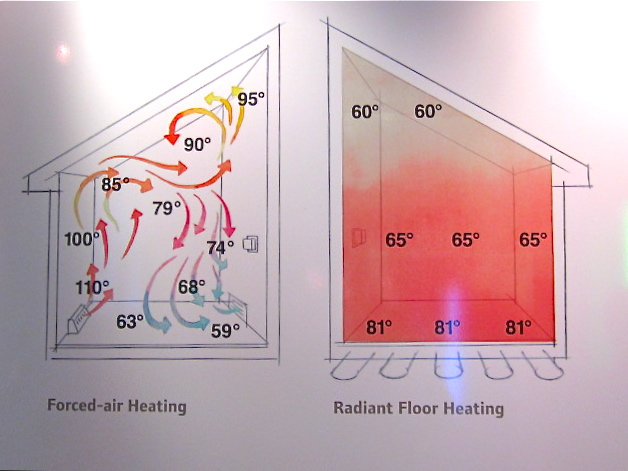 I took a picture of the graph above which basically shows the difference in forced air heating temperatures within a room vs. the radiant floor heating. The cold air pockets in my house are enough to make me want to investigate radiant floor heating and cooling in a future home, especially if it is the difference between pumping hot or cold water through the tubes. I plan to visit the S.E.E.D. home and will update you on what I learn about this award-winning, net-zero, affordable home. ‹ PreviousShouldn’t Every Day Be Valentine’s Day?